Lately in the InstaWorld, mermaid shirts and tees have become very popular over the last year or so. The thing with these cute sea shell “mermaid” shirts is that they are quite expensive. My boyfriend actually bought me a sweater version of these tees for Christmas and I LOVE it. The weather is still somewhat chilly where I live, so I am able to rock my Mermaid Sweater quite a few times a week, if I wanted. 😉 But like I mentioned, even on sale, he spent almost $60 on a plain white sweater with two purple sea shells. He was happy to know that I loved my sweater but not without mentioning how expensive it was and then saying the best thing ever…, “It looks like YOU can make this”. Interesting… it looks like I could make it, really?! The more I looked at my awesome sweater, the more I realized, this looks quite simple to make. Especially since a few months back, I was really considering getting into screen printing shirts. So, I went on a long journey online, trying to find and use mermaid scales from Google, Pinterest, Tumblr, and just about wherever I could look. The thing is I was unsuccessful finding the size I wanted and just a simple mermaid scales pattern. So, I used my resources I already had. I had already had other items that I was going to use instead of the recommended items. Honestly though, I wish I would have also purchased a cutting mat because that would have made cutting out my stencil much easier and less stressful on my hands from applying pressure while cutting my stencils out. 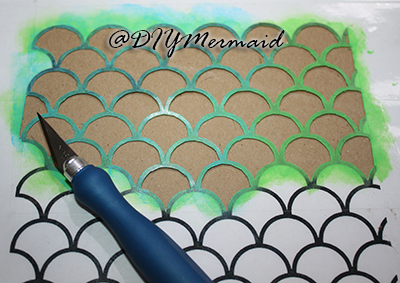 So, after I managed to gather my necessities, I began cutting out the “black” part of my mermaid scales stencil. Come to find out, that was the WRONG area, which I was able to correct fairly quickly and had just learned now, how to cut out mermaid scales! 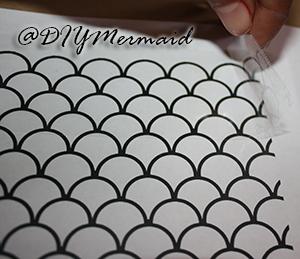 So, as my gift to you, I share my newly found knowledge in cutting out Your Very Own Mermaid Scales Stencil. Depending on the paint you buy, you can decorate furniture, clothes, and just about anything else they might make paint for. Enjoy!! Make sure that the stencil is the size you want before printing. This is where using a picture editor will help you in resizing pictures. Once the size is selected, print the stencil out on paper. Since we are using weak paper, it is important to make it stronger by adding clear packaging tape on the stencil, as well as the back of the stencil to strengthen the paper and to be able to use the stencil more than once. Get your Cutting Mat out and get your workspace ready. Put the printed design on top of the cutting mat and adjust the portable light, if using one. Then, carefully begin to cut out the “Whites” of the mermaid scales. You should be left with tear drop holes once you have cut out and removed the white area of the mermaid scales. Do this until the entire inside of the stencil it cut out. PS, take your time!! *Do not cut around the parameter of the paper. Once you have completed steps 1-3, 3 taking the most time and patience, you are now able to begin stenciling away. Use scissors to cut off excess paper. If you are going to create a shirt, make sure to buy Textile Paint/Fabric Paint, so that your design does not come off. Use a dabbing motion when applying paint on stencil and surface with a sponge of your choice. *Different sponges will give you different textures, so try and experiment until you find the one you prefer. 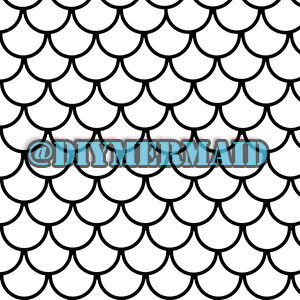 And now you have Your Very OWN Mermaid Scales Stencil!! If you tried this DIY Project and loved your results, PLEASE share! I’d love to see what cool designs everyone comes up with!! 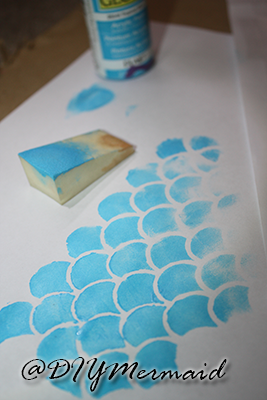 These instructions are not only for Mermaid Scales… you can print any design you would like. Follow the same steps and you can create a variety of stencils and designs. My next project will be to create a multi-layer stencil, but so far, its easier said than done. And one last note, make sure to have fun with this… I got a bit stressed at first with all the mistakes but we live and we learn and now I’m here sharing with others how to create their very own stencils. It’s much cheaper than buying decal shirts! !